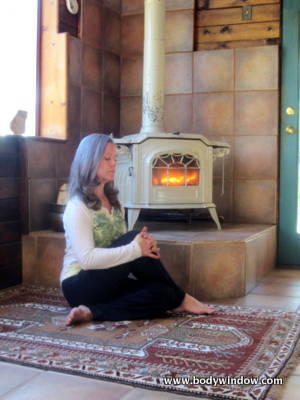 Self-healing energy is created by understanding the spirituality of the body through meditative movement. A lot has been written on energy healing and moving energy through practices like Reiki and therapeutic touch (or healing touch, which is not actually physically touching the body), clearing the Chakras, and so forth. While I believe that ‘energy’ healing really does work, it often requires the presence of another, healing person, moving energy for you. If you are of the self-healing personality type like I am, I believe that you can create your own positive energy movement for healing. You can create your own self-healing energy. The other day I was foam rolling, one of my favorite intuitive movement practices. I always get such benefit from foam rolling and this day was no exception. I know just where to move, into my familiar body aches. I was rolling my hips, stopping and sinking deep into the ache. It suddenly occurred to me that I was actually moving energy in my body. Just like the Qi Gong practice of mentally moving energy in your body, and moving energy through meditative movements, I was moving energy through the practice of foam rolling. I get my energy (emotions) stuck in certain parts of my body, usually my hips, and it feels to me like there is congestion there. So when I really get into that area through foam rolling, I am able to move that energy up and out. It brings me relief of the aches and congestion in that area, so that I can move forward in a positive fashion. Now for all you athletes out there who use foam rolling as a purely physical tool, you might not get this. But I am convinced that if you just move your body, you are changing the patterns of your energy. And this is a self-healing energy that is moved. Foam rolling digs deep to change your stuck energy patterns into positive and self-healing energy. This is why movement is so important and so life sustaining. One of the realities of health versus illness is that when movement ceases, you are dead. I mean this both literally and metaphorically. I believe that we all know this, consciously or subconsciously. It is innate within us. It is our body’s wisdom, our physical sense of being and our inner knowing. 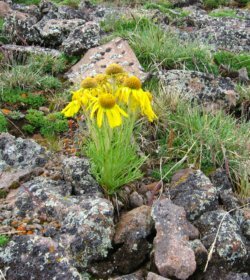 Colorado Wildflower ~ "Old Man on the Mountain"
From a purely medical perspective, I watch the complications of immobility in my patients all the time. They are deep vein thromboses (blot clots), decubiti (pressure sores on the skin), urinary tract infections, respiratory infections and pneumonia, to name a few of the life-threatening conditions that occur with immobility. Nursing measures involve getting people out of bed ASAP after surgery, turning bed-ridden patients every 2 hours, getting all types of tubes out as soon as possible to increase mobility and reduce the likelihood of infection, and to do pulmonary hygiene measures to prevent pneumonia in immobile patients. Did you ever notice that with the world’s great spiritual practices that physical movement is always involved? With Yoga, a practice whose name means “Union with God,” you find Hatha Yoga, which is the movement or poses (asana) part of Yoga. 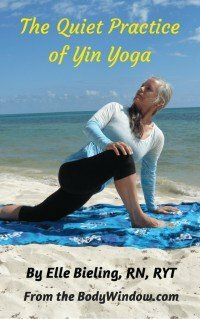 Yoga has many parts and the movement that we know of in the West is only a small part of the spiritual practice of Yoga. The purpose of Hatha Yoga, or movement yoga, is to properly prepare the physical body for meditation, and therefore Union with God. The movements are a way to purify the body! There is no better self-healing energy that is created then when one wishes to do movement in order to connect with God! I personally love Yoga for this. With ancient Chinese traditions you have Tai Chi and Qi Gong that teach you physical movements that move energy or Qi (Chi), in order to contact with Spirit and Power. I have explored Qi Gong myself, as a means to expand my mind and expand my health practices. I have felt drawn to these ancient practices, because I understand the full meaning of the spirituality of the body. It is part of my aching for new experiences, new meaning, and new awareness. It is the human spiritual yearning, the yearning for meaning and purpose in life. In the Native American cultures there is the Dance and drumming. The same is true with many indigenous cultures. Their dances are sacred practices that are part of sacred rituals designed to increase their spirituality. I am sure you can think of many other cultural expressions of spirituality through physical movement. A movement that is meditative, opening yourself and your body to receive from God/the Universe, creates spiritual, self-healing energy. Especially when used in this fashion, the body is truly sacred. In Christianity there is … Oh, what is there? There is only a total denial of the ‘flesh.’ In traditional westernized Christian teachings often we have been taught to beat the body into submission. It is our minds that control all things and it is only through this denial of the flesh that we can find God. There is no Sacred Dance, no Yoga, no healing Qi Gong. In fact some Christians are even suspicious of these practices, as something evil. What a shame! In all fairness, there is a contemplative movement in Christianity that is starting to embrace the spirituality of movement. Contemplative Christian practices emphasize silence, contemplative walking like walking in nature or in a labyrinth, contemplative prayer (similar to meditation) and a deeper, often mystical connection with God. Some contemplative Christian groups now incorporate various energy movement modalities with roots in their ancient practices stemming from desert wandering, pilgrimage, dance and/or nature. It is a revival of these ancient physical practices that is finally sweeping Christianity. Finally, Christianity is waking up to the wisdom of the body, and that moving the body is an important path to moving the heart, mind and soul! So has it been any wonder that many more of us in the West are turning to the ancient practices that understand and utilize the spirituality of the body? Why has our modern culture evolved to deny or even ignore that during physical movements, a positive energy is created? And this very movement creates self-healing energy? Why does our culture separate the body and the mind in all things? Why have we lost the ability to re-unite the spirituality that exists in our very cells? Why does even the science of healing in our country still seek to deny this connection? Why do we go out and exercise our bodies like machines, pushing them past injuries, without thought of the long-term mental and physical effects? I don’t know if I can answer all these questions, but I do have my theories. All in all I believe that part of our longings are to reconnect us with ourselves. Our bodies are ourselves and we have lost our ability to connect our heads and our bodies. Hence, the dis-ease and distress and aches in our lives. So, just move your body! Make it meditative and make it a reconnection with your whole self ~ your body, your mind and your soul! I am of the opinion that we do not necessarily need to turn to ancient movement practices for moving energy into self-sustaining and self-healing energy. Although these ancient traditions do seem to have it pegged. It may be easier to learn if you start with the ancient wisdom. However, any movement can create self-healing energy. This is what intuitive movement is all about. This is meditative movement that heals the body-mind-soul. The body-mind-soul actually requires this self-healing energy in order to heal. The body itself insists on movement in order to create self-healing energy! No matter what intuitive movement you choose, you are moving your energy in a positive fashion. It doesn’t matter if it is walking or running or skiing or biking or cleaning house. It could be Yoga, tai chi, or painting the house. Be mindful of your energy movement, this self-healing energy that is created when you simply move your body. It will have an immediate effect on your outlook and your life if you learn to stay present with your movements. If you are not moving towards something, you are moving away from that same something. Make all your movements positive and healing! So go create some self-healing energy through movement now! Your body-mind-soul will love it.